Exciting new scenarios, new units, and huge maps await you in Ashes of the Singularity: Escalation's largest DLC yet! Take on the role of a PHC leader and conquer dangerous missions where the odds are stacked against you, or join with the Substrate to repel your PHC oppressors. Engage your enemies on huge new maps, conquer one of the new scenario challenges, and more. ♣ PHC Atlas - This anti-air, anti-drone frigate is an excellent line of defense against Drone Hives. Since it only costs metal and doesn't require radioactives, the Atlas is a less powerful, but inexpensive, alternative to the Apollo cruiser. ♣ Substrate Tormentor - This indirect fire frigate is capable of saturating an area with artillery shells, causing damage to anything in its radius of attack. Although it lacks accuracy and direct single target damage, the Tormentor is at its most powerful against groups of units rather than structures. ♣ Ascension - The Substrate have developed a prototype experimental Eye of Darkness. Build up your defenses and survive the onslaught of your enemy in order to destroy the weapon before it wipes you out. ♣ Battleline - A large Substrate army looms across the map, just waiting to attack. Your base is established and ready to go; now, you only need to push out strong units, maintain your resource levels, and survive. ♣ Carnage [PHC] - You're ready to make your last stand against the massive Substrate army. In the biggest scenario to date, face down 7 enemy opponents while also helping your 6 allies stay alive long enough for you to claim victory. ♣ Carnage [Substrate] - You're ready to make your last stand against the massive PHC army. In the biggest scenario to date, face down 7 enemy opponents while also helping your 6 allies stay alive long enough for you to claim victory. ♣ Deadlock - The Substrate are making huge pushes toward capturing valuable Turinium mines. Build up your forces and fight off the enemy before they reach critical mass or overrun you. ♣ Entropy - The members of the Post Human Coalition are attempting to overrun your Substrate base before you gain a critical mass of Turinium. Hold them off at all costs. ♣ Incursion - The PHC have launched an attack on Substrate territory. You have the initiative, but there's no one around to help you - you will have to defeat them on your own. ♣ Influx - Ventrix has tainted the name of the PHC for long enough. Overcome the scarcity of resources and take him out with vicious orbital attacks. Copyright © 2018 Stardock Entertainment and Oxide Games. Ashes of the Singularity is a trademark of Stardock Entertainment. 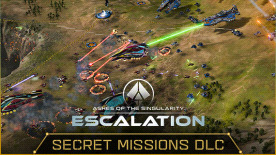 Please note: Requires Ashes of the Singularity: Escalation (base game) to use this DLC.